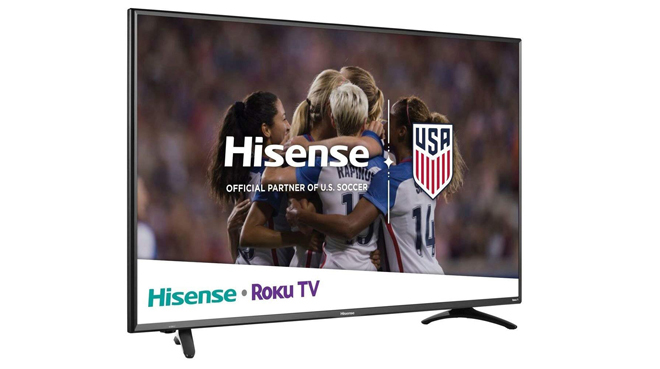 Overview -- Serving as an affordable entry-level 4K HDR TV option, the 50" Hisense R7 Series features a direct-lit LED panel, HDR10 support, and Roku's robust smart TV platform, offering access to a comprehensive selection of streaming apps. But while the display's overall picture quality is solid for its budget-friendly price, high dynamic range performance is quite limited and black levels and viewing angles leave a bit to be desired. Still, though not quite up to spec for genuine home theater viewing, an R7 Series makes for an ideal secondary display perfect for casual viewing in a bedroom. Worth a Look. While many Smart TV platforms are quite effective, few would argue that a dedicated Roku streaming player typically offers a superior interface and a greater selection of apps. With that in mind, it should come as no surprise that Roku now integrates its simple and intuitive OS into a selection of display models from various manufacturers. And this brings us to the 2018 Hisense R7 Series -- a new entry-level Roku TV with 4K HDR support and comprehensive streaming access. Designed to appeal to budget-conscious buyers without sacrificing functionality, the set aims to strike an attractive balance between price and picture quality. The 2018 R7E 4K UHD Roku TV is currently available in 43-inch, 50-inch, 55-inch, and 65-inch screen sizes. 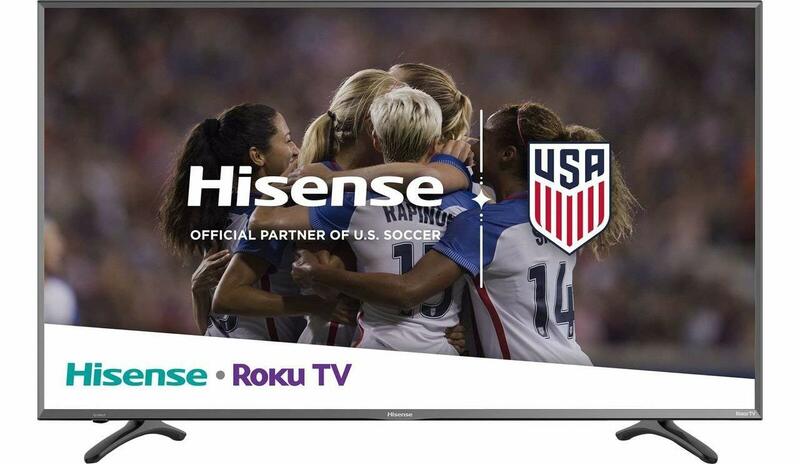 For this review, Hisense was kind enough to send over the 50-inch model, which MSRP's for $399.99 and can often be found for around $350. Just how well can a 50-inch set under $400 really perform? Well, though far from a flagship model, the R7 ends up packing in some pretty decent value for its class. 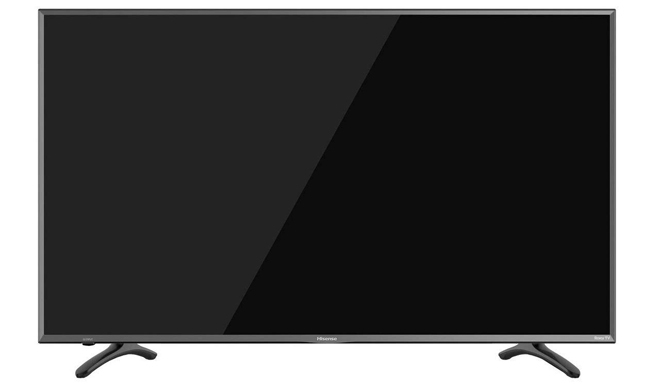 The 2018 R7E 4K UHD Roku TV uses a VA LCD LED panel with a 16:9 aspect ratio, an Ultra HD resolution of 3840x2160, and a 60Hz native refresh rate. In addition, the panel features a direct-lit backlight. With that said, the screen does not offer local dimming capabilities. HDR10 support is included as well, but the TV is only rated for the standard Rec. 709 color gamut. When processing HDR material with a Wide Color Gamut, the TV re-maps the content to the best of its abilities. As one might expect from an entry-level model, the R7 features a decidedly budget design. Of course, that's not to say that the TV comes across as particularly cheap or flimsy in construction, but it definitely lacks the added flourishes many step-up models offer. A black plastic bezel surrounds the panel with a border measuring about a 1/2-inch and a profile coming in at about 3.3–inches at its deepest point (the bottom back of the panel protrudes out further than the rest of the display). Separate left and right feet stands are included as well, and while they get the job done just fine, I still prefer a standard pedestal design. 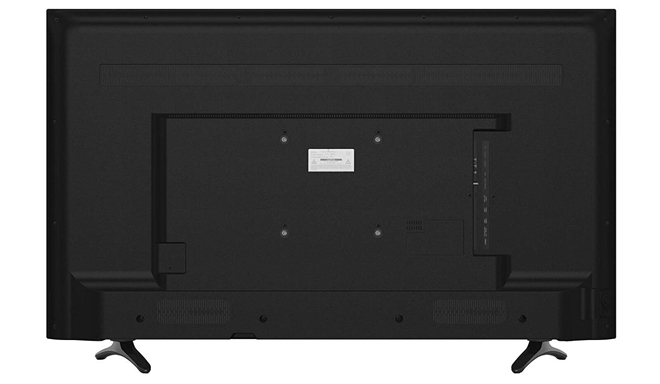 With the stands attached, the TV measures 44.4"W × 27.7"H × 9.7"D, and weighs 30 lbs. A power jack is included on the right side of the panel while all of the TV's video and audio ports are housed on the left side. 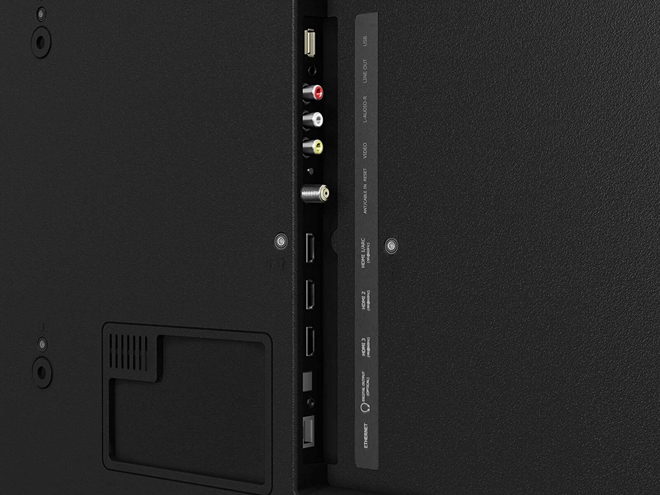 Connectivity options include three HDMI 2.0b inputs, one USB port, one RF antenna port, one RCA composite video input (shared with component), one Digital audio optical output, one Earphone/audio output, and an Ethernet port. In addition, the display offers Dual-Band Wi-Fi support. Under the hood, the TV is powered by the Roku OS and the unit comes with a standard Roku remote. 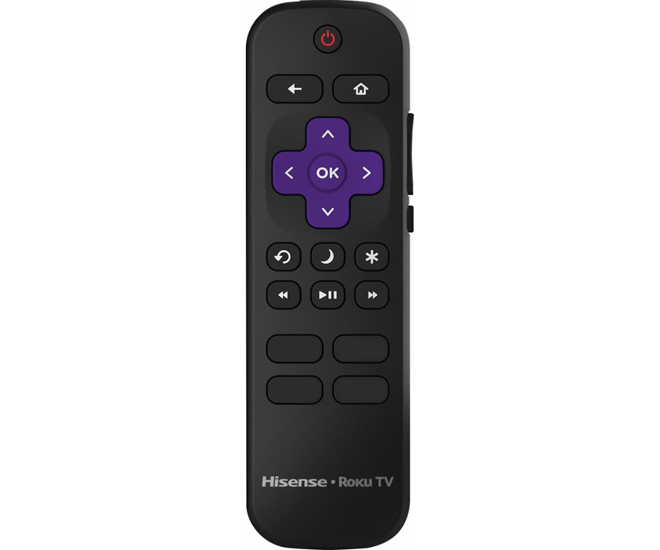 The remote should be familiar to anyone who has owned a Roku player, and features a simple yet functional layout for directional navigation, Power, Home, Back, OK, play/pause, and settings, along with dedicated launch buttons for Netflix, Hulu, Sling TV, and PlayStation Vue. Likewise, volume controls and a mute button are integrated on the right side of the remote. The remote does not feature integrated voice search capabilities, customers can opt to download the Roku app on a mobile device to control the TV with voice search support. For those who don't have a separate surround sound system or sound bar unit, the TV features an integrated 10W x 2 audio system. Like most built-in TV speakers, these get the job done but lack much in the way of dynamics or low-end, resulting in a shrill sound and limited scope. With that said, Hisense has included a wide assortment of audio presets for different content, along with DTS TruSurround, Dialog Clarity, and TruVolume options -- allowing users to tweak the audio a bit more to their liking. Like most modern Smart TVs, setup is a tad more involved than just plugging the display in and pressing power, but the initial process is still quite painless and simple. After unpacking the box and screwing in the feet stands, users just need to connect the power and plug in any external devices. Once turned on, the TV prompts customers to select a language, country, and environment (home or store). From there, users can enter their wireless information to establish an internet connection. A software update will then download if necessary. Next, the TV will ask customers to visit roku.com/link on a web browser and enter in the provided code in order to activate the display. If you don't have a Roku account, you will need to create one in order to complete this step. Following the activation, the web browser interface asks users to choose a name and location for the TV, along with some desired channels. After making a selection, the TV starts to add and update the chosen channels. An easily skippable intro video then starts to play and after that… setup is finally complete! If you have a receiver or sound bar connected to the display you will also want to make sure that the CEC option is activated in the System settings menu. Likewise, if you have 4K HDR devices connected to the TV you will want to make sure that HDMI 2.0 is selected for the corresponding port under the TV Inputs settings menu. Meanwhile, standard Picture adjustments are available for each input as well by pressing the Asterisk symbol on the remote after the desired source is selected from the main menu. Likewise, additional expert picture adjustments for gamma, noise reduction, 11-point white balance, and color space can be accessed via the Roku app on a mobile device connected to the same Wi-Fi as the TV. Though it's very nice to have these options for further fine-tuning, I do wish they were just integrated into the TV's menu rather than the mobile app. For SDR playback, users will get the most accurate out-of-box dark room performance using the Movie picture mode with the TV Brightness option set to Darker (a brighter mode will, of course, be more suitable for bright room playback) and the color temp set to Warm. When HDR10 content is played, an HDR badge will flash toward the top right of the screen. For HDR, users will get the most accurate out-of-box performance with the highest nit output using the Dark HDR picture mode with the TV Brightness option set to Brighter and the color temp set to Warm. Unfortunately, however, the TV Brightness setting does not seem to remain independent for SDR and HDR content. This means that while I preferred Darker for SDR content and Brighter for HDR, the TV would always keep the same setting for both modes forcing me to manually change the brightness back and forth every time the display switched from SDR to HDR and vice versa. For review purposes, I primarily used the R7 with a Pioneer VSX-933 AV receiver. Likewise, I also swapped in a VIZIO sound bar system for some of my testing as well. But while ARC and digital optical audio were correctly sent to these external devices from the TV, the volume was unusually low in both cases. When playing content through the TV's integrated apps I found that I had to pump up the audio on my receiver about 10 decibels higher than I usually have to with my external devices (Blu-ray player, Roku 3, etc.) and other TV models. Though I was still able to get adequate volume this way, the lower output from the TV was a bit odd and proved to be a little annoying when switching from TV app playback to my Blu-ray player, as I had to constantly re-adjust the volume back down. Likewise, though the actual content was always lower than usual, the navigation sounds in apps like YouTube and Netflix were output quite a bit higher leading to loud clicking effects when browsing. I scoured the menus to see if some kind of volume normalizer or dynamic range compression setting was the culprit, but couldn't find any such options. To be clear, the TV was still able to output audio correctly, including surround sound and Atmos mixes, and it's possible I'm just missing something simple here in the settings, but as it stands, the comparatively low volume was a bit of a pain. To demo the R7's HDR performance, I watched a variety of 4K Ultra HD Blu-ray discs and HDR10 streaming content from services like Netflix, VUDU, and Amazon Prime Video, including titles like Fantastic Beasts and Where to Find Them, Game of Thrones, Logan, Blade Runner, Ex Machina, La La Land, The Punisher, Justice League, Spider-Man: Homecoming, Blade Runner 2049, The Tick, and Mozart in the Jungle. While HDR10 playback does indeed offer some benefits here, it's important to note that the R7 does have a couple of key limitations when it comes to high dynamic range performance. For one, the set is only capable of a peak brightness of about 330 nits. While this is higher than the 100 nit standard used for SDR content, it's well under the 600 – 2,000 nits found in many mid-range and high-end 4K TVs. Likewise, it's quite a bit lower than the 1,000 nit target that most HDR10 content is graded for. Second, without local dimming, the TV is not able to precisely brighten or darken smaller highlights and shadows, offering less control over contrast throughout different parts of an image. And though still fairly decent for a direct-lit LED panel, the lack of dimming also leads to higher black levels than those found on step-up models, limiting the range of shadow delineation. Finally, the R7 does not include Wide Color Gamut capabilities either. Though the set does technically offer a bit more coverage beyond the Rec. 709 standard, it's not enough to qualify for the DCI-P3 color space used in most HDR material. Still, despite these caveats, the TV is capable of processing HDR WCG material to the best of its abilities, mapping HDR10 content to suit the display's max brightness and color specs. Relatively punchy HDR playback, even if it does lack some of the depth, range, and pop found on higher-end sets. When comparing SDR discs to their HDR counterparts, the R7 offered a slightly more vibrant image when in HDR mode -- though colors were often fairly similar depending on the title. Movies like La La Land, Logan, and Ex Machina offered much more subtle improvements here than on other displays I've tested. That said, reds, in particular, were often a bit bolder. Specular highlights and shadows also came through with a little more intensity, but the comparatively low nit output and lack of precision dimming did limit some of their impact. Still, certain titles looked quite stunning regardless. To this end, Blade Runner was especially striking on the R7, bringing the neon cityscape to life with impeccable fine detail, sumptuous colors, and dazzling contrast. Likewise, more aggressively graded material like Justice League and The Tick also shined nicely. Meanwhile, Fantastic Beasts offered a more noticeable upgrade from its SDR counterpart here than some other titles, especially during the sequence where Newt takes Jacob into his suitcase. With that said, contrast actually looked a little too hot in a few shots during this scene, leading to slightly crushed shadows and blown out whites. On that note, the limited nit performance did lead to a slightly dim picture in darker HDR10 sequences. This was especially true during more conservatively graded content like Game of Thrones. Likewise, material with a lot of nighttime footage, like Marvel's The Punisher, more readily revealed the set's black level limitations when watching under home theater conditions, leading to a fairly murky quality in dark scenes that lacked the pleasing inkiness and range that higher-end local dimming and OLED sets are capable of. Of course, it's important to remember that this is an entry-level model with a bargain price-tag, so HDR limitations like these are all to be expected -- and the resulting picture was quite pleasing considering the TV's performance class. Beyond 4K HDR content, I also sampled several SDR Blu-rays and streaming shows, including titles like Skyfall, Wall-E, The Avengers, Star Trek, The Tree of Life, Star Wars: The Last Jedi, Guardians of the Galaxy Vol 2, What We Do in the Shadows, and more. Unlike HDR playback, the R7 is much better equipped to meet the standards of SDR material -- and in general, HD content looked quite good on the display, offering strong detail, accurate color, and decent contrast. The climactic battle in The Avengers was a highlight, with sharp clarity allowing one to make out each and every alien invader zooming through the skies of New York. Several scenes in Skyfall were also quite striking, especially the nighttime scene where Bond arrives at the Macau Casino on a small boat bathed in orange light glowing from an array of floating lanterns. In fact, many high contrast night sequences like this popped beautifully on the R7. Sadly, however, dark scenes without bright objects mixed in once again revealed the set's black level limitations. Meanwhile, lower-bitrate streaming content from various apps looked fairly good as well, and the set did a decent job of scaling low-res material too. Of course, the relatively small screen-size here also helped to mask some of the imperfections inherent to this type of material. When it comes to overall screen uniformity, the R7 is fairly solid but not perfect. When displaying full-screen tests patterns for various colors and shades of grey, some darker bands and areas could be seen around the screen, especially when a paler hue was on the TV. Meanwhile, black uniformity was pretty decent on an all-black screen, but I could detect some clouding in the corners. Likewise, a slight dirty screen effect was visible during movement in bright white scenes, but the effect was not outside the norm for most LCD panels. Unfortunately, viewing angles were a bit more problematic. Contrast and colors took a noticeable hit when viewing the screen just slightly off to the left or right of center. Dark scenes were especially troublesome in this regard as just tilting my head slightly would cause a shift in contrast on one side of the screen even when sitting directly in front of the display. Lastly, reflections were decent but not great for a budget model with limited brightness. As long as you're not positioning the TV directly across from some windows (like I have to) the set should work just fine for daytime viewing. Hell, the blacks usually look better with the lights on, making it a pretty good option for more casual viewing habits. Powered by the Roku TV OS, Hisense's R7 offers a comprehensive selection of streaming apps, including popular services with 4K HDR support like Netflix, Amazon Prime Video, VUDU, FandangoNow, and YouTube, along with virtually any other platform you'd want like Hulu, Google Play, HBO GO, Showtime, and more. Overall, navigation and playback were fairly responsive during my testing, though they were never quite as smooth or seamless as they are on my dedicated Roku 3. On that note, there were times when I had to press buttons more than once to get them to register and there was a faintly sluggish quality to selections here and there. Likewise, there was even one isolated instance when the TV stopped responding to the remote completely and would not even turn off when I held the power button on the display itself, forcing me to actually unplug the power cable to get it to restart. Thankfully, this only happened once and, in general, the Roku OS operated just fine. Beyond standard app support and options for various streaming rentals and purchases, the Roku interface also includes access to the Roku Channel and 4K Spotlight Channel. The latter compiles various 4K and 4K HDR titles from different apps, making it easier for users to see what Ultra HD content is out there. It's a decent inclusion, but I typically preferred just to open individual apps and browse their selection there. The Roku Channel, however, is a bit more substantial. This service offers a surprisingly solid selection of free movies and TV shows, including a mix of contemporary titles and classics like The Matrix Trilogy, School of Rock, 50 First Dates, 3rd Rock from the Sun, In the Line of Fire, Blown Away, The Misfits, Bewitched, The Evil Dead, and more -- in HD and surround sound when available. Likewise, the app also includes access to live TV content from ABC News, Cheddar, Newsy, and PeopleTV. Finally, the Roku OS also offers mobile app control. This feature usually worked pretty well, allowing me to navigate and make selections on my smartphone exactly as I would on the included click button remote. Likewise, the mobile app includes voice search support and this feature worked quite well. With that said, despite always being on the same Wi-Fi connection as the TV, there were a few times when the app could not find my display, forcing me to restart my phone to get it to work again. As an entry-level 4K HDR display, the Hisense R7 Roku TV offers solid specs for its price-range. HDR brightness and color are limited, black levels do take a hit from the lack of local dimming, and viewing angles aren't the best -- but the level of performance and smart TV functionality you get here for a 50-inch set under $400 isn't too shabby. There are some competing 50-inch sets from manufacturers like TCL and VIZIO that offer similar picture quality, but most of those models are either a little more expensive or feature slightly less impressive specs. For what it is, the R7 is a relative bargain -- though the performance increase an extra $200 will yield on a step-up Roku TV model, like the $600 TCL 55R615, is quite substantial. As it stands, I can't quite recommend the R7 as a dedicated 4K HDR home theater display -- but it's definitely a very solid choice for customers who want a Smart TV geared more toward casual viewing, especially for a bedroom or other secondary location around the house. Worth a Look.